Brrr... hasn't it been cold lately? 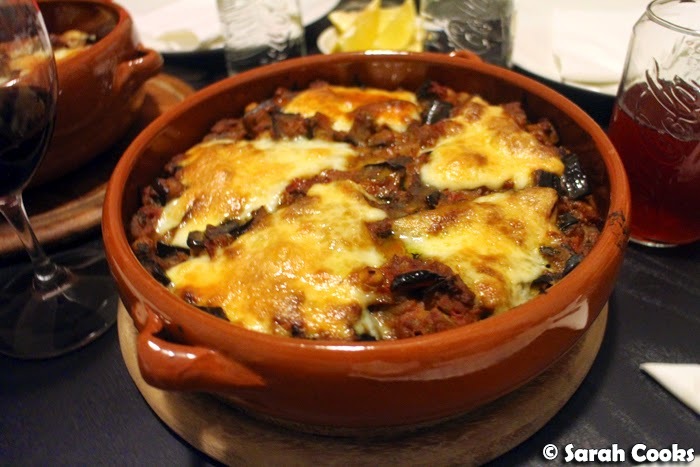 I am definitely in the mood for comfort food, and this cheesy-eggplant quinoa bake really does the trick on a cold night! 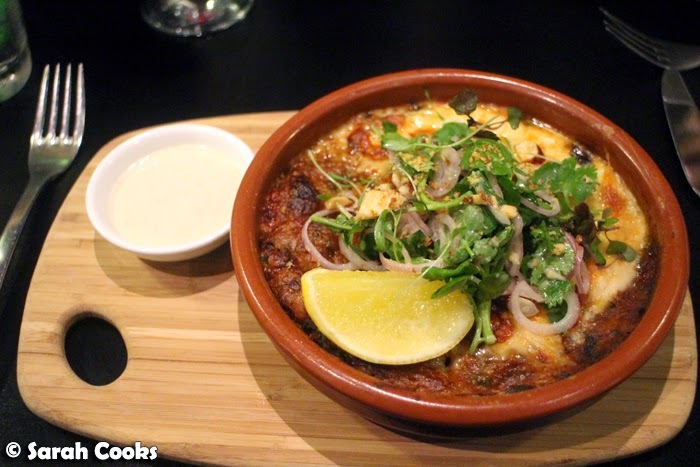 This isn't my recipe, but rather Chef Leigh Robbin's from HQ's restaurant in the Radisson Hotel on Flagstaff Gardens. You see, a little while ago, I was invited to try out dinner at HQ's. It was a fun night and there was lots of delicious food, (see some photos at the bottom of this post! 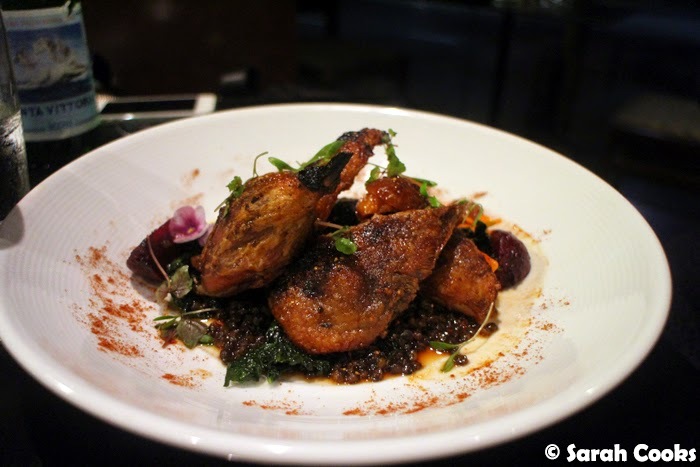 ), but what I was really impressed with was Chef Leigh Robbins' take on imam baildi. Traditionally the dish consists of whole eggplants, stuffed with onions, garlic and tomatoes and simmered in olive oil, but Chef Leigh's version was a little different. His imam baildi consists of a base of quinoa topped with Turkish-spiced eggplant and tomato ragu, slathered in saganaki and baked. It was so good, and super comforting! After the meal, I emailed the PR company who invited me to see if Chef Leigh would mind sharing the recipe, so I could put it on my blog, and - hooray! - he agreed and they sent it to me. 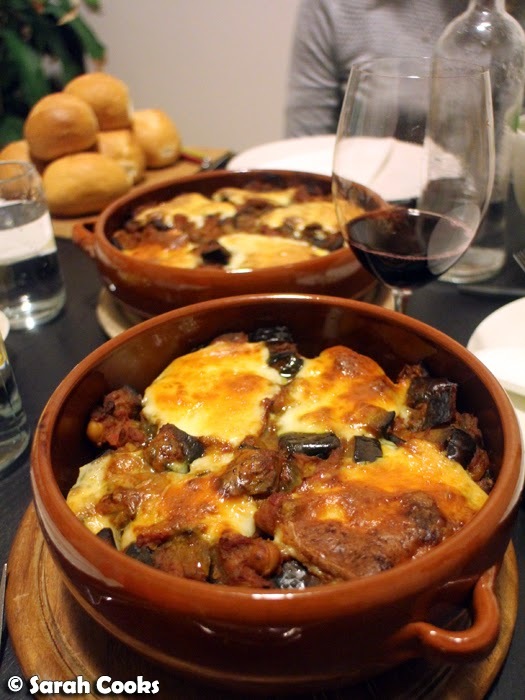 I made it at home for a dinner party (the quantities were huge but I wanted to test if it would work), we all loved it, and now I'm sharing the recipe with you. (Rewritten in my own words and with some slight adaptations to make it easier for home cooks). 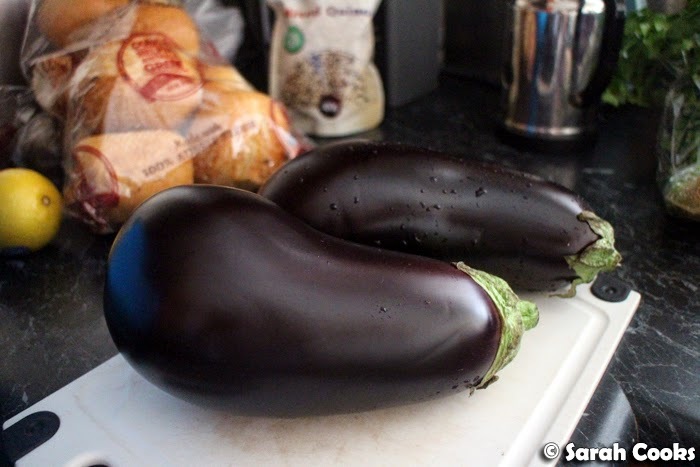 You then cut some eggplants into cubes, and roast them in the oven for ten minutes. I loved all the different spices - smoked paprika, tumeric, cumin, coriander. It made the kitchen smell lovely! I know my version doesn't look quite as pretty as Chef Leigh's, but it tasted good and it went down a treat! Leftovers reheated really well in the microwave too - bonus! I think you could easily make a big batch of this on a quiet weekend, and then have delicious lunches ready for the week. The dish, with its quinoa, sauce and cheese, is really a complete meal in itself, but I think some crusty bread and a green salad alongside are a good idea. I also added some lemon wedges on the side, and a mixture of Greek yogurt and tahini. 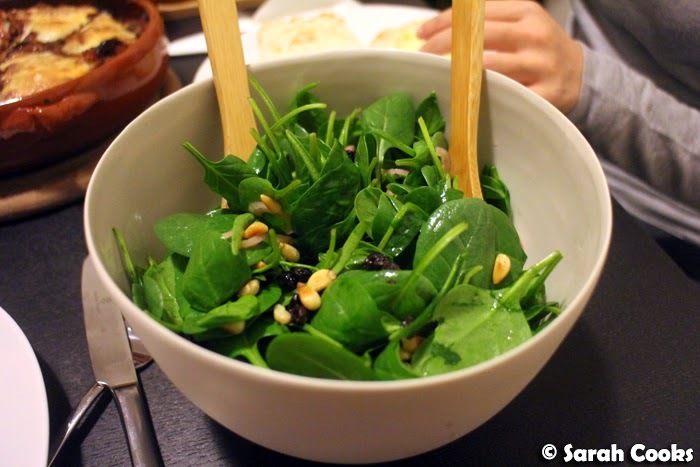 The salad I chose to make was a spinach, pine nut and currant salad - simple but very tasty and versatile. I'll share my recipe with you soon, but for now please enjoy Chef Leigh Robbin's recipe for his delicious imam baildi! Thank-you for sharing the recipe with me, Chef! 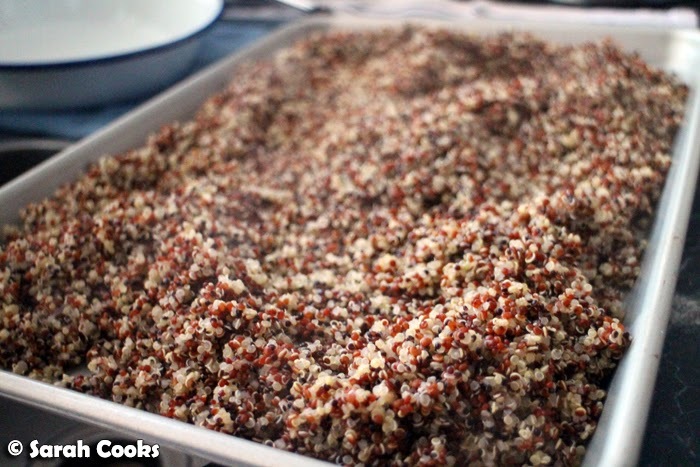 Cook the quinoa according to packet instructions then drain and set aside. Preheat the oven to 190C. 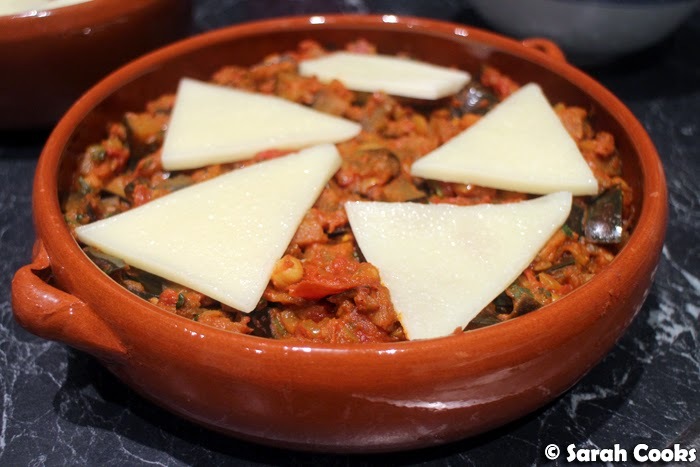 Cut the eggplant into 1 centimetre dice, place in a bowl, sprinkle generously with salt and set aside for 30 minutes. Place eggplant cubes on an oven tray with some olive oil, toss to coat. Roast for 10 minutes, then set aside. Heat some olive oil in a large pot, add the onions and garlic and cook until the onions are cooked through. Add chopped coriander roots and stems, cumin powder, coriander powder, turmeric and smoked paprika. Cook together for 2 minutes while stirring. 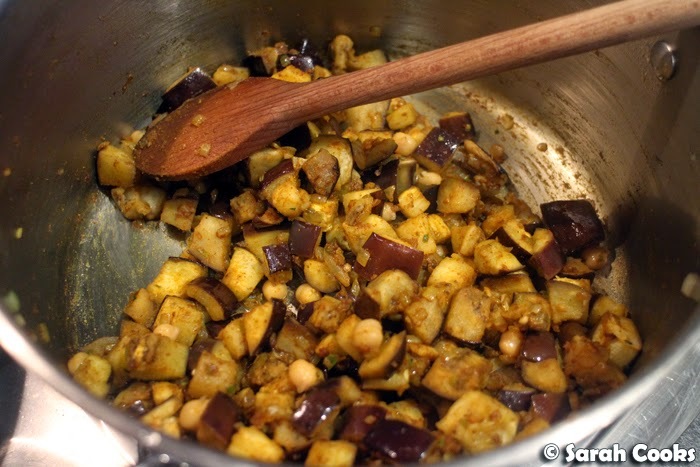 Add the roasted eggplant cubes and stir to coat. Add the tinned tomatoes and chickpeas. Bring to the boil, then turn the heat down and simmer for 25 minutes, stirring occasionally. Remove from the heat and add the roughly cut coriander leaves. Taste for seasoning. Brush your desired serving dish lightly with olive oil. (I used three 20 centimetre pie dishes). 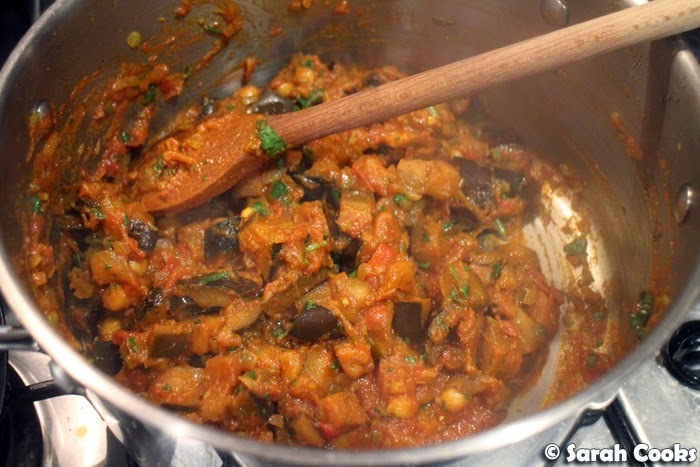 Place the desired amount of quinoa in the bottom of the dish, then cover with eggplant ragout. Thinly slice the saganaki and layer on top of the ragout. Bake until the cheese is melted and golden brown, and the filling is piping hot. So as I mentioned above, here are some of the dishes we tried at HQ's the night we were invited. Overall, the food was very good, and the portions were huge! Based on the dishes we tried, I found that the entrees would make a nice lunch or light dinner, and the mains could easily be shared between two. 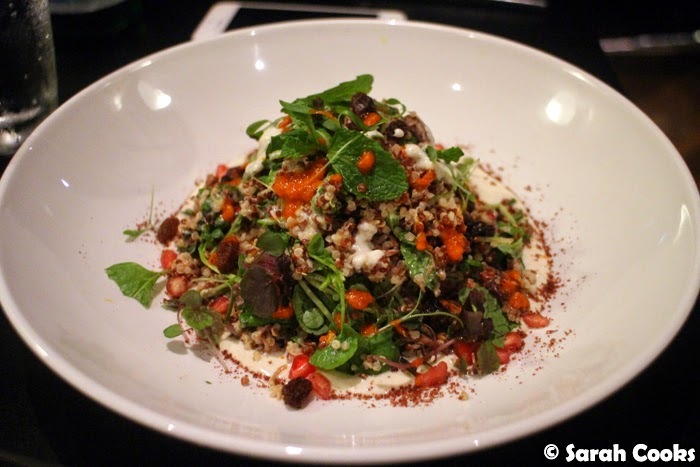 I really liked the lamb shoulder and quinoa salad - there was a generous amount of very tender lamb underneath the quinoa, and a nice mixture of spice and freshness from the herbs, labne and harissa. I enjoyed all the flavours in the prawn and crab linguine - I can't resist bisque - and there were lots of prawn and crab throughout the dish. My only (minor) complaint was that the linguine itself was cooked a tiny bit more than I like. The twice-cooked duckling was both tender and crisp, and the sweet caramel sauce gave a nice counterpoint to the rich duck without being sickly sweet. Sarah and Sandra dined at HQ's as guests. 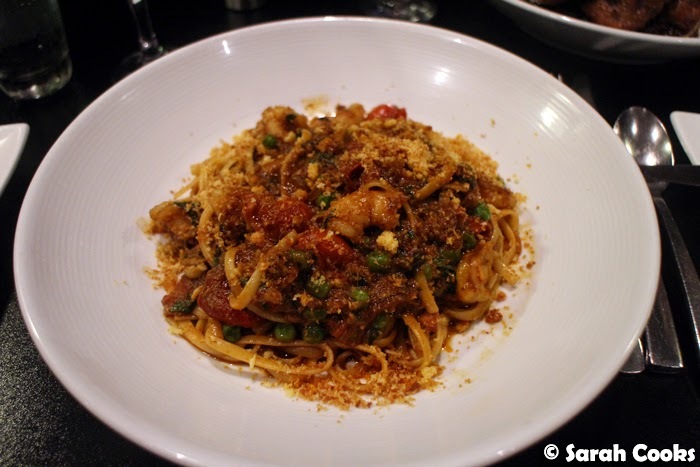 The prawn and crab linguini would definitely do it for me, and I would love to try Imam Baildi! Nothing like that in the country! I'm such an eggplant fan, and I love how simple this looks! It also looks like it's easy to substitute if you wanted to as well, ie brown rice instead of quinoa. Imam Baildi sounds interesting. And your version looks very delicious! And the other cuisines from HQ are very irresistible!